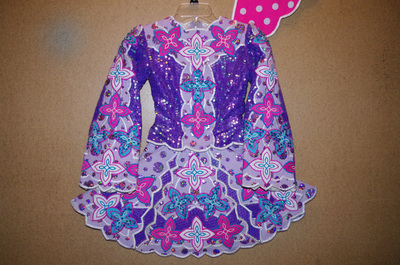 Purple sequin and lavender with turquoise and pink celtic designs. Skirt and cape are lined with bright pink and white polka dots. Great starter dress. Very Sparkly! Asking Price: $US200. Shipping costs are included for my own country, overseas shipping is extra. Will accept returns and refund the cost of the dress, buyer to pay all shipping costs.